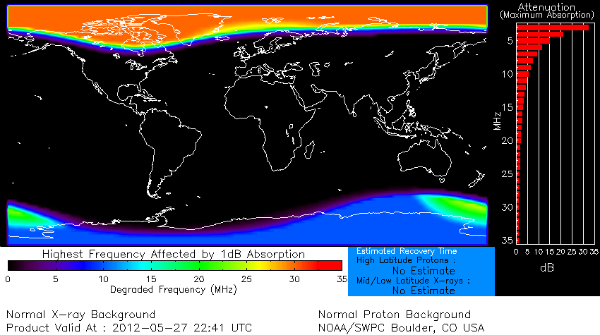 The proton levels reached S1 Minor Radiation Storm threshold today. The Solar X-Rays also detected a long duration C-Class event during the early hours of Sunday morning and this generated a Coronal Mass Ejection (CME). It appears that the plasma cloud was directed mostly towards the east and will miss Earth. The magnetic canopy of sunspot AR1492 erupted on May 27th at 05:51UTC, producing a long-duration C3-class solar flare and hurling a coronal mass ejection (CME) toward Mars. Analysts at the Goddard Space Weather Lab say the cloud will hit the MSL spacecraft (containing Mars rover Curiosity) on May 31st at 01:00 UTC followed by Mars itself about 10 hours later. Sunspot 1492 is crackling with C-class solar flares. All other regions are currently stable. 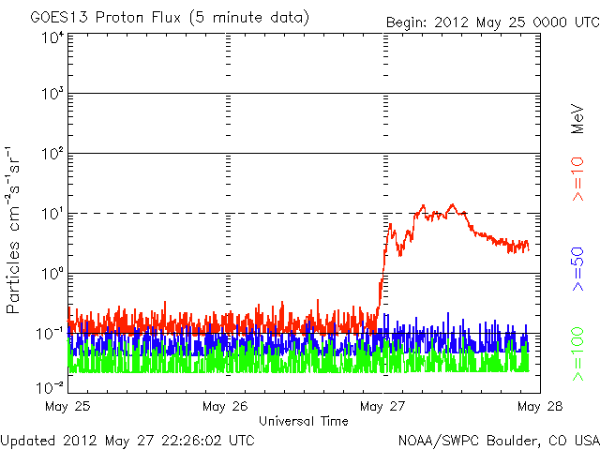 CME was observed at the end of the period yesterday. No flare was observed in conjunction due to a source from around the west limb. However, type II and IV radio sweeps were observed from the event, in addition to a later observed 10 MeV proton event (NOAA Scale S1). The CME shock and driver cloud are observable in LASCO C2/C3 as a backside asymmetric halo and are not expected to be geoeffective. Solar activity is expected to be very low to low for the next 3 days (28-30 May). The geomagnetic field was quiet. The greater than 10 MeV proton event at geosynchronous orbit that began at 27/0535Z, reached a maximum of 14 pfu at 27/1045Z and ended at 27/1235Z. The greater than 2 MeV electron flux at geosynchronous orbit reached high levels during the period. The geomagnetic field is expected to be mostly quiet for the next 3 days (28-30 May).